Why become certified as a Venice Nutrition Coach? Become skilled at motivating a client from their initial assessment to their last visit. A Venice Nutrition education = increased referrals and business! Who should become certified as a Venice Nutrition Coach? Together these leaders have joined forces to create a revolutionary certification process to guide anyone on correct nutrition and blood sugar stabilization, physiology, and how to coach your clients to reach their unique goals. What does the Testing and Certification procedure include? Upon purchase of the Nutrition Coach Certification Course, you will immediately have access to the Coaches Network. Instructions on how to access your account and download your Study Manual will be emailed to the address you enter on the check-out page. You may choose to take the exams whenever you are ready. You must pass exam one in order to proceed to exam two. Both exams must have passing scores in order to earn your Nutrition Coach Certification. The exam will be available online in the Coaches Network “Exam Tab”. 75 questions, true/false and multiple choice. Results: Your exam is graded immediately after you click on the “submit” button or after 90 minutes have passed. A minimum score of 80% is required to pass. Re-testing: If you do not pass this exam you can re-test within 7 days. The fee is $25.00 and you will have 6 additional months to complete this exam. Please contact healthpro@venicenutrition.com. 80 questions, true/false, multiple choice, fill in the blanks, short essay. Results: Your exam will be graded within 7 business days. A minimum score of 80% is required to pass. Re-testing: If you do not pass this exam you can re-test within 14 days. The fee is $75.00 and you will have 6 additional months to complete this exam. Please contact healthpro@venicenutrition.com. 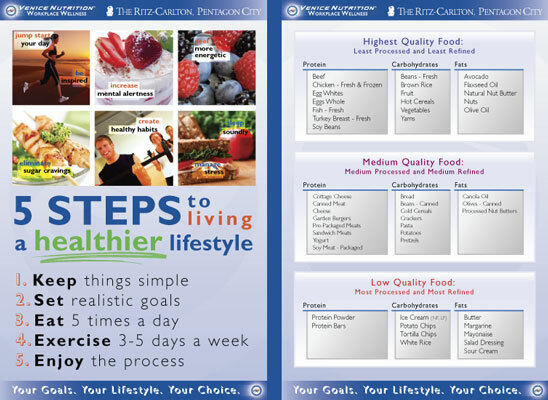 Once you’ve passed both exams, your customized Nutrition Certificate will be emailed to you within 1-2 weeks. If you need a CEC letter for NAFC or NASM, please email healthpro@venicenutrition.com. Are there any pre-requisites to becoming certified? Simply put, no. We have designed our certification process to be beneficial to anyone, including beginners to the industry and seasoned professionals such as nutritionists, personal trainers and gym/spa owners. 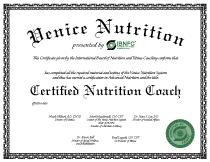 How long does it take to become certified as a Venice Nutrition Coach? The certification may take anywhere from 2 weeks to several months. You may progress at your own pace. The exams can be taken online when you are ready >>. The health industry is ever evolving. The Nutrition Coach Certification Course will provide you with three main keys to stay ahead of the curve in the industry. A Solid Educational Foundation: Venice Nutrition teaches from the root, meaning everything you will learn in the course is backed by science and physiology. The educational information is robust and provided in multiple formats via manuals, videos, webinars, audio files and documents to ensure retention of the information. The Art of Communication & Coaching: Knowledge is your foundation, communication is your bridge. How you articulate the information to your clients will determine your success as a coach. By understanding the main components of communication you will develop the skill set to lead your clients to their desired health goals. The certification course, videos, Coaches Network, and webinars will teach you how to maximize time, energy and your client’s results through communication and coaching. This support system will keep you current and inspired and will lay down a path you can always follow to find the answers you need and give you the confidence to lead a thriving consulting business. For those wanting to consult and set up personalized client meal plans for their nutrition businesses, we recommend our Venice Nutrition Licensing System. Licensing will provide you with one-on-one support and mentoring from a Master Venice Nutrition Coach to help build your business, answer your questions and continue to help move your brand and business forward. One-on-one support (other than the support listed above) is not available unless you are a Venice Nutrition Licensee. Your Venice Nutrition Certification is valid for 2 years from the date you receive it. 2.0 CECs will be required to maintain a valid Certification beyond your first two years, and for every two year period thereafter. Is this a Nationally Accredited Certification? Yes it is. It has been Nationally Recognized since 2003. Venice Nutrition’s Medical board, the IBNFC, possesses all of the Correct Legal Qualifications for the Nutrition Coach Certification to be Nationally Recognized. There is a difference between Personal Training Certifications and Nutrition Certifications. Unlike Personal Training Certifications there is not a National Board that oversees Nutrition Certifications. Nutrition is viewed by each state as a higher skill level than personal training, so in essence there are tougher laws and requirements. The governing body is the Dietetic Association for each State and they enforce the Dietetics Practice Act. In essence every Nutrition Certification can be called “Nationally Recognized”, the big question is whether you can Legally Teach Nutrition in a state with that Nutrition Certification. With a Nutrition Coach Certification offered by the IBNFC & Venice Nutrition alongside an implementation of the VN Software System, you CAN Legally Teach Nutrition in any state located in the United States. Does this Certification allow me to Legally Teach Nutrition? Yes, it does. While 99% of all other Nutrition Certifications do not provide the ability to actually legally teach nutrition, the Venice Nutrition Coach Certification does. A Registered Dietitian can also legally teach nutrition, however, the nutrition education a Registered Dietitian typically receives through a university is primarily designed to work with clients who are in a diseased state. This education fails to provide real answers on how health professionals should educate their clients on how to work nutrition, fitness and other health parameters permanently into their lives. Mark Macdonald created the Venice Nutrition Coach Certification as a solution to the lack of education and inability for health professionals to teach others on how their bodies really work and how to achieve permanent results. He knew that if you were not a Registered Dietitian, there were three necessary tools that needed to be developed to give health professionals the opportunity to legally teach nutrition throughout the United States and be in accordance with the Dietetic Practice Act. A Nutrition Company with an Advanced Curriculum for its Nutrition Certification Course and a Scalable System for administering the exams. In 2003 Venice Nutrition Launched the most Dynamic Nutrition Certification in the Industry and Created an Online Environment for Testing. A Nutrition Company with a Software System overseen by its Medical Board with the purpose of administering nutrition programs. In 2003 Venice Nutrition launched its first software system that provided customized nutrition programs. Mark understood the importance of continual software development and for this reason, launched the Technology Division of Venice Nutrition in 2003. The VN Software is a powerful application for both Nutrition Coaches and their clientele. Teaching Nutrition: With the Venice Nutrition Certification alone you can legally teach nutrition and educate people. For example, if you are a personal trainer, with the VN Certification, you could give your clients advice/coaching on nutrition to help them achieve their goals, or you can do group presentations for all of your clients. If you are a Wellness speaker you could give group presentations on nutrition and/or conduct seminars. (please note “teaching” does not mean being a Teacher in an educational institution, that requires a 4 year degree amongst other requirements). Since the Venice Nutrition software is overseen by our medical board (which includes a Registered Dietician) it is 100% legal for you to provide your clients with meal plans using the VN software program. What is the Dietetic Practice Act? Because of the Credentials of the Venice Nutrition Medical Board, the Advanced Certification Course Curriculum & the Robust VN Software System, any individual that becomes Certified as an IBNFC Nutrition Coach & utilizes the VN Software System CAN Legally Provide Nutrition Services (one on one coaching, group coaching, workplace wellness programs, etc…) throughout the United States. Does VN’s cert provide CECs for other certifications? Yes, we are currently a provider for NASM. We will be adding additional companies starting Early 2016. NASM – 1.9 units. NASM requires all certified trainers to accumulate 2.0 units over a 2 year period of time. The Nutrition Coach Certification provides nearly all of the required units and in addition teaches information that can be applied immediately with your clients. How do I open a nutrition consulting business or improve my current consulting business? Venice Nutrition is committed to continual support and development. We’re always moving forward as an organization and are driven to stay proactive in the industry. Because of this, a certified nutrition coach or a licensee will have unlimited cutting edge information and support 365 days a year. Going beyond support – we’re committed to growing with your company. 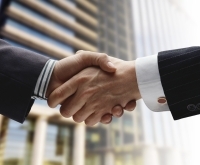 We understand that to maximize growth, business needs to be built before you have a business. It is our responsibility to show you the unlimited possibilities with Nutrition and Wellness… For those reasons We’ve created a 5 Phase approach in adding Nutrition and Wellness to your business. Each phase has its own objectives and time frame. Many consulting practices choose to implement all 5 phases and many others choose to implement 2-3. There is no right or wrong way to do it. Everything depends on the goal of your business. The IBNFC Nutrition Coach Certification is the most Advanced Nutrition Certification In the industry. This certification will teach you the necessary physiology, communication, coaching and sales skills that are crucial in becoming a great nutrition coach. Once you’re able to work with a diverse audience, you’re ready to add Wellness Programs to your business. They’ll allow you to reach an audience worth of people in the same amount of time it takes to speak with 1 or 2 people. Wellness programs are designed for companies, schools and other organizations. Our Wellness Division can assist you with this phase. As you develop phase 2 and 3, your time will become tighter. With Venice Nutrition you have a turnkey training system for team members. As you grow, you’ll want to expand your team to assist you with servicing your clients and wellness contracts. Potential coaches can immediately plug into phase 1 and go through the entire certification process. This is a crucial point because it will allow you to focus on building your business and not get bogged down with the task of training a new coach from scratch. This is another reason that partnerships can help grow your business. Once Phase 2-4 are complete, you can begin to focus on expanding your business. A Consulting practice with Venice Nutrition immediately launches your business into the National spectrum. Our System gives you the ability to expand using Radio, TV, Online Communities like Facebook and Twitter, newspapers, magazines, etc. These Venice Nutrition Business Coaching Courses are designed to meet you where you are with your business and provide you a seamless step-by-step system to expand your outreach and powerfully spread your message. Each course is structured identically. Support: support via text and email between sessions. Each session has a specific action plan and assignments to work on between sessions. Each session progresses and builds off the previous session. Coach: Mark Macdonald (if schedule permits) or a Venice Nutrition Master Coach. To see if Mark is available please email us here. You may choose the course that best fits your need. 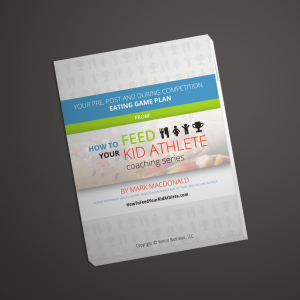 How can I create customized meal plans for my clientele? Web Based Software that can be accessed anywhere in the world. Gives the ability to create your member’s customized meal plans. With access to the Management Software, you will have the ability to customize individual nutrition and health plans according to each client’s unique goals, needs and lifestyle. A VN customized health structure provides your clients with meal plans based on their individual nutritional parameters, exercise, sleep, supplementation and water intake. This ability is included with our Venice Nutrition Consulting Practice License. How do I offer Wellness Programs? A great way to maximize your time, reach out to the community and build your clientele is through Wellness Programs. As a health professional there are only so many hours in the day to work with clients, wellness programs create the opportunity to work with many individuals at once. When presenting at an event it is always more powerful to provide all attendees with a game plan that will reinforce the message you are delivering. For this reason Venice Nutrition has created the Workplace Wellness Partner Program. With this program you will be able to enroll all attendees on the Online Program and receive custom designed materials for your events. Audio Files guiding you Step by Step on how to market & enroll wellness events as well as how to prepare and perform Wellness Presentations. Yes, we offer a fantastic speaker training program that will teach the tools that will enable you to fully engage an audience and develop your skill set of showing each attendee the possibility of making their Health a Priority. The training program will provide you with the confidence, reputation and foundation to lead an audience to success and maximize the growth of your business. Session 1 – Facing your communication obstacles and understanding the 4 main types of communication. Getting clear on the type of speaker you want to be and the main message(s) you want to share with audiences. Session 2 – Creating your 20, 30, 45 minute keynote centered on the Why, How and What of your message and adding personal stories to connect your message. Deciding when to use a PowerPoint, a flip chart or nothing at all. Session 3 – Utilizing your body language, expressions and voice rhythm to enhance your message. Immediately connecting with your audience and making them part of the entire speaking experience. Session 4 – Learning the 5 strategies to maximize your delivery on video and TV to get the outcome you want. Coach: Mark Macdonald (if schedule permits) or a Venice Nutrition Master Coach. To see if Mark is available for Business Coaching please email us here. What happens after I purchase the certification? Immediately upon purchase of the Venice Nutrition Coach Certification Course, you will have access to the Coaches Network. Instructions on how to access your account will be emailed to you along with a detailed Step by Step Certification document which walks you through how to get started. Instructions on how to download your Nutrition Coach Certification Course Manual will be sent to the email address you supply when purchasing your certification. Instructions can also be found in the ‘Step by Step Certification’ document. You may choose to take the exams whenever you are ready. You must pass exam one in order to proceed to exam two. Both exams must have passing scores in order to earn your Nutrition Coach Certification. If you wish to learn more about how you can use your Venice Nutrition Certificate to run your own Nutrition Consulting Practice please visit our Licensing page www.VeniceNutrition.com/Licensing. Why Enroll In A Nutrition Certification Program? Are there any pre-requisites to becoming certified as a nutrition consultant? What is the average salary of a nutrition consultant or health coach? What is a certified nutrition consultant or health coach? What are the benefits of being a health coach or nutrition coach? What does the Venice Nutrition Certification Program Offer That Other Programs Don’t? Why become certified as a Venice Nutrition Coach or Health Coach? Who should become certified as a Venice Nutrition Coach or Health Coach? Can I take an online nutrition certification? What does the Venice Nutrition Certification Package include? What is the best way to become a health coach or nutrition coach?